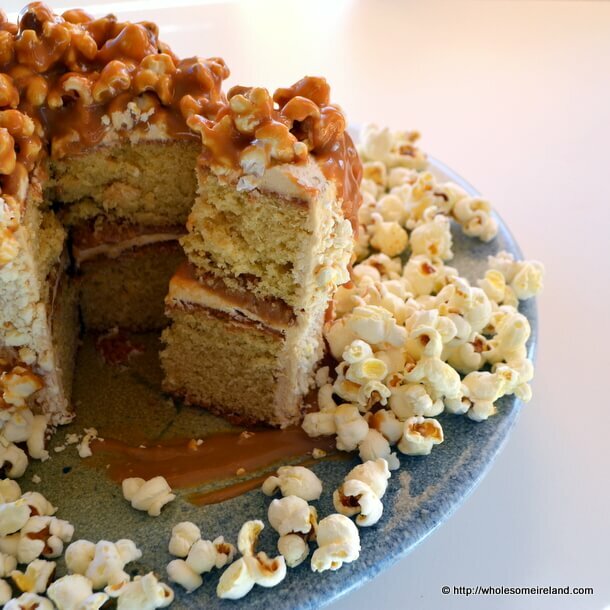 I have been working the idea of making a Salted Caramel Popcorn Cake for a couple of weeks. Sometimes a recipe comes into my head and until I make that cake, it just keeps on bugging me. This is my belated ( a month late) blog-anniversary cake. Can you believe Wholesome Ireland is now over a year old? Not that I’m a newbie to the world of blogging, in fact I was only going through my very early stuff from the Wholesome Cook blog recently and I started that in 2009! It has all been archived by the way and I will be revisiting and re-photographing some of the older blogposts in the next few months. What better way to mark a milestone than with a cake? 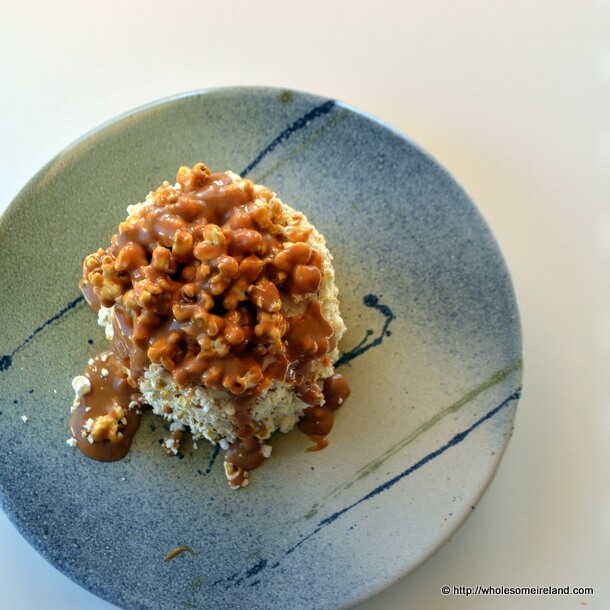 Today I’m not going to talk about calories or how much it costs to make a Salted Caramel Popcorn Cake. Mind you it does come in quite inexpensive, relatively speaking. For a cake like this, it’s not hard to make, you just need a little time. Some of the important things to bear in mind. Make the cake part the night before. It makes it easier to assemble the following day. Make the popcorn the night before also. You don’t want fresh popcorn for the crumb coating or the topping as it needs to have dried out a little. Although if you’re stuck, dry it in the oven in advance of “blitzing” to small pieces. You can, if you wish, make your own caramel sauce for the cake. I was very lazy as I found a tin of caramel in the cupboard during my stocktake last month that I thought I had used. 1 tin does the whole cake. The cake recipe serves 20 adults, smaller portions will yield more pieces of cake though. It is sugary so if you’re going to serve at a kids party, go with small slices! I use 2 x 15cm diameter springform tins for this cake layers. Preheat your (fan) oven to 170 degrees Celcius. Grease and dust your springform tins well. Consider also using some greaseproof baking parchment although this isn’t a “must-have”. In a large bowl, beat the butter, sugar and caramel until light and fluffy. Add the eggs 1 by 1 beating everytime so that the mixture doesn’t curdle. Finally beat in the flour, baking powder and vanilla extract. Divide the cake batter between the two tins. Bake in the oven for 35 mins. After which time check to see if they are cooked by using a skewer or cocktail stick. If they come out clean then remove the cakes from the oven and leave to cool on a rack in the tin for 20 minutes before releasing. Otherwise bake for a further 5 mins then check again. Combine all 3 ingredients in a large bowl until you get a paste. Then whisk vigorously. The paste will turn a lighter colour and become fluffy. You will need a further 100g caramel, some optional sea salt flakes and the equivalent of 2 large (50g) bags of popped corn for this part. Put the flat side (normally bottom) of the first cake facing down. Top with a layer of the icing. Then coat the icing on top with 50g of the remaining caramel. Put the second cake on top, flat part facing upwards. Using a spatula, coat the entire cake with a thin layer of icing. Then put the cake in the fridge for an hour to chill or into the freezer (if you have space!) for 20 mins. While the cake is in the fridge, take half the popcorn and blitz/mash it into small pieces. Once the cake has chilled, take it out and coat with a second thin layer of icing. Sprinkle the sides of the cake with the blitzed popcorn pieces. Take the un-blitzed portion of the popcorn and combine with the remaining caramel. Spoon the caramel on top of the cake and sprinkle with a little sea salt. The cake is very beautiful! 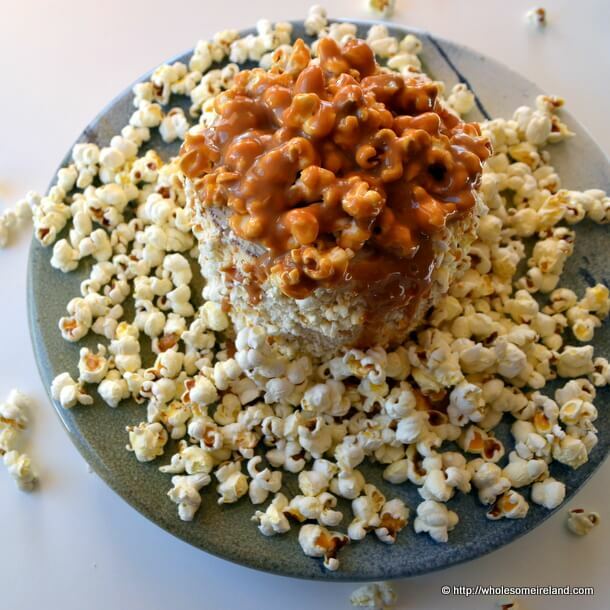 Love the idea of using popcorn and caramel for a cake! Very creative! Thank you Laura. I only wish my pictures did it justice! this looks AMAZING!!!! i might try it at the weekend, when LENT finishes – it looks like it would be the best treat ever! thanks for putting it on your blog!!!! Thanks Lu. Great idea to splurge after Lent. Have a great Easter.